You mean there's … crime? Over on Bill Coburn's News.net blog Mayor Pro Tem* John Harabedian is now taking his turn to make a pitch for Measure UUT. But sadly it is pretty much the same tired fiduciary fabricating we've been hearing from that quarter for the last six or so weeks. You know the rhythm, the library will close, the Police Department will go away, the unquiet dead will rise from their graves and the neighborhood coyotes will stop by for coffee and steal your silverware just as soon as your back is turned. The world might end, too. You never really can tell, right? Pretty much standard issue stuff from our current ambitious young politico, though. If you want to make it to the big time in the Los Angeles County political machine you need to be an earner. And in that world earning means suckering more tax money out of the citizens. If you can do that, and pump that tax money into the pockets of the many special interests and government employee unions that grease the skids of that machine, then you could go far in so bizarre a world. When deciding how to vote on Measure UUT on Tuesday, residents should be asking themselves one overarching question: what type of city do I want to live in five or ten years from now? The reason why I am voting Yes on Measure UUT is because I want to ensure that Sierra Madre will continue to be the safe and vibrant community that we live in today for years to come. My “Yes” vote is directly informed by my experience as a long-time Sierra Madre resident. Having grown up in Sierra Madre, I have a few vivid memories about my childhood. One is always feeling safe within the City’s confines. There was not a day in my life in which I felt vulnerable while riding my bike with friends, playing in Sierra Vista Park, or walking home from school. The Sierra Madre Police Department is searching for the rightful owners of recovered stolen property. The Sierra Madre Police Department recently arrested a suspect for residential burglary. The suspect entered unlocked residences and vehicles to steal property. The department has recovered several items of property believed to be stolen. In an effort to determine the legitimate owner of the property, the recovered items will be on display on the police department’s web site. You can go to the following link http://cityofsierramadre.com/departments/police-department to view photographs of the recovered property under the file(s) named SMPD case # 130652 and/or SMPD case # 140071. The link will be available for viewing between April 1, 2014 to April 30, 2014. If you have been a victim of burglary during the past year, please look through the listed photographs and identify property by the image number. Once you have identified property you believe may belong to you please call to arrange an appointment with the Sierra Madre Police Department Detective Bureau. You must provide a police report and/or proof that the items you have selected belong to you. The proof can be in the form of a photograph depicting you wearing the item, a serial number, or a receipt clearly describing the property. If you go to the link provided by the SMPD (click here), you will taken to page after page of photos of stolen goods. Laptop computers, jewelry, silverware, watches, you name it they got it. It really is a striking collection of other peoples' property, photographed in an otherworldly setting. Perhaps, like us, you too have had your house robbed over the past few years, and you'd like to take a look? You just might see an old friend pictured in there somewhere. There is also a related article on the Pasadena Star News website called "Sierra Madre Police looking for owners of recovered stolen goods." You can link to it here. And while you're at it, you might also want to take a look at another one called, "$2,500 reward offered in Sierra Madre pharmacy burglary" (link). I don't believe that reward has been collected yet. BURGLARY SUSPECTS IN CUSTODY: On March 31, 2014 at 1:34 PM a local resident noticed two male African American men standing outside of a residence in the 100 blk of S. Baldwin Avenue. The resident had never seen these individuals in the area and thought it was suspicious that one walked towards the house while the other watched from the front looking up and down Baldwin. Officers arrived in the area and the two suspects took off. A few minutes later an observant resident saw the two male African American males walk to a trash can in front of his residence on Esperanza and dump a large screw driver and a glove in the trash can. Officers arrived in the area and found the suspects behind the band shell at Memorial Park. They were taken into custody without incident. They were positively identified by our witnesses. Both suspects are from out of the area. They were booked for an attempted residential burglary. Without the help of these citizens someone in the city would have become a victim today. So please remember if you “See something Say something” it does pay off in the end. I am not really certain that any politician hoping to get the residents to vote themselves a utility tax increase would want to be pushing the "Safe Sierra Madre" meme right now. We are coming off one of the worst home invasion crime waves in this community's history, and there are still a lot of bad feelings and unhappy memories out there. Then again, could any politician say what the Measure UUT utility tax hike is really all about? Increased pensions, benefits and some of the highest costing city employee health care plans in the entire State of California? All backed by the highest utility tax rates anywhere? Not if you want to be an earner. Be sure to check out Chief Giannone's stolen property picture gallery. I am not sure there has ever been anything quite like it in Sierra Madre before. Yes, it appears that Mr. Harabedian is an "earner" as he tries to ingratiate himself with the political machine. The political machine needs more money in order to pay higher salaires, benefits and pensions for the city employees whose union then has more money to elect politicians like Mr. Harabedian who votes for higher salaries and UUT taxes and so it goes. In every city (and I mean every city), they use the same arguments i.e. scare tactics - to pass the tax: police response times will increase, fire department will be gutted, libraries will close and on and on. City Councilmen like Mr. Harabedian don't want to face the ire of the "machine" so they perpetuate the lies. I say, let them face the ire of the taxpayers. One way to start, is to vote No on Measure UUT. The next way is to vote Mr. Harabedian out of office. Harabedian is the same lawyer clown who photoshopped out SMPD badges out of photo and used it as an implied endorsement of the SMPD for Council, which as a "lawyer" he knew was improper but then again, he's a "lawyer". hey John, why you lying to us? Can't go to Pasadena, it's across the Michillinda curtain. Anyone who has been here on the tattler will not be voting to tax us all more. The facts are clear when you read over everything so tattler readers are all no votes as we see the facts. If you saw the news last night you could see TAX THE PEOPLE 101 in the process regarding raising the tax .5% for the roads in Los Angeles. The politicians are all taking the same class, oh we don't want to do it or we hate to ask but we need the money. Just like Sierra Madre's water pipes and LA Cities roads, the money has been there but it has been spent for something else. No matter how much they tax us they always need more. It is time for some professional work to come out of city hall. Who are you going to believe, two CPA's or someone working to pay for their salaries and pensions, I'm going with the CPA's I'm voting NO on the UUT. What was not funny to me was the SMPD saying they have a 3 min. response time, my kid can ride his bike across Sierra Madre in 3 minutes, who is fooling whom here? I wonder if the SMPD is still patrolling outside the city limits - the blotter used to list arrests for traffic violations and dui's etc outside the as far as Live Oak Ave n Arcadia. Chief Diaz made sure that the published police blotter was sanitized and any SMPD actions outside of the city weren't included. The SMPD has an increased budget but they also have an increased crime rate. Are they really spending this extra money in the right places? You the taxpayer will be supporting them for the rest of their lives. Are they willing to do the same for you? I was looking at the Chief's email and I couldn't help but notice that Henry "Shoot 'em in the back" Amos is now a Detective. When did that happen? Is he a "plain clothesman?" The shooter must still be here because we can't hire anyone else for that low of a salary, or the shooter is still here because he will sue us for not training him better. It's time to get rid of the Harabedian's in the city. Johnny just does not understand the basics..
Johnny is relying on Elaine and the other 3 city council member to think for him. why do we not just call those that lie like this when we see them out, "hey dude, why you lying about the UUT?" u notice how the lawyers can lie so well and so glib with the BS? Low bid 7:03, low bid. 6:45 makes some good points. You notice the city always cries about services going away because there is not enough money yet the always conveniently forget to talk about income to the city like the over 800,000.00 the city received from the Kensington and all the money they are getting from other building permit fees, not to mention that property tax receipts are increasing. The city needs to learn to live within a budget just as you and I do. And as for our "underpaid" city employees, well, if they feel they can do better elsewhere, then let them go there. this is a free market, someone else will take their job for the money and benefits we can pay. Sierra Madre has no obligation to pay what other cities pay. I foe one, hope that the two CPAs who co-wrote the NO ballot argument will run for city council. we need people who actually understand numbers and finance on the council, instead of a bunch of fools who think a cap on UUT tax rates for high water users will bring, as their yes flyer states, more "big box" businesses to town. the old "big box" scare? hey, don't make fun of that "3 minute" response time. it has been one of No(ah) Pants biggest campaign arguments on why we need to keep our police dept. No(ah) has noted that no other police dept. around can make that claim because our police are so good. if you like, I can also share No(ah)'s great ideas about Halloween. From what I hear and see many city workers have put in their resumes at other jobs but none have been hired. Seems many on the city staff are afraid of the city manager and her crazy management style. Elaine is an earner, too. That is why Nancy and Johnny love her so. Money is power at City Hall. Take away their money and they're nothing more than people with opinions. Just like everyone else. They keep saying that other cities pay better but they never leave. Guess they can't get hired. Maybe those folks haven't been hired by other cities because they are unqualified. is anyone else as tired as I am of little Johnny H. Continually dragging out the fact that he grew up in this fair town? and besides, when he grew up here and felt "oh so safe" riding his bike in town, there were not as many police in town as there are now. Harabedian writes like he thinks the people reading it are idiots. "Directly informed" and "overarching" indeed. I don't know. It is kind of comforting that Yale and Stanford can turn out such a mediocrity. The playing field is more level than a lot of people think. Enough money can buy you anything.It's the magic wand! Susie Henderson asked a ton of folks to write a "No" argument so she can appear to be "fair" when there is no way on earth she'd ever endorse a "No." Never asked a "no" supporter to Kiwanis. Had John H. the MPT* and John Capoccia, both tax hike lovers, to present both sides. Then had Mayor Mean last Tuesday to talk for the "yes" side. Susie and Coburn are terrified to have a "No" supporter debate the facts with them. Henderson is the only person with the ability to publish something to endorse Noah Green. Yes, she's nuts. For Q&A last Tuesday, someone should have asked Mayor Walsh why she wasn't running again. She never did say, did she? I think The Tattler made Nancy quit. It might have been the pictures of all those empty downtown stores. Her statement in 2010 about how empty storefronts were a disgrace to Sierra Madre was about to come back to haunt her. Just as it was getting dark I discovered a huge swarm of bees on the sidewalk, seemed to me that if someone walked into that in the dark It would not be good. I called the Police and it took 30 min for an officer to arrive, he said to call the humane society, it was not a police issue, humane society said to call a bee keeper. several of my neighbors an I kept watch to prevent anyone walking by from stepping into the swarm, The bees left at dawn. I was a burglary victim. Once again, SMPD's police work consisted solely of blaming the family for leaving a back window unlocked. whatever. the point is that smpd is a non factor in preventing crime, just like my two dogs were in preventing the burglary. it's not that they are bad guys, they are just kind of useless for purposes other than picking on skateboarding teenagers, shooting guys hopping out of parked cars, and filing lawsuits against the city. the sheriff would be equally useless at crime prevention. the sheriff would also cost us $1.5 million less a year. That is $15 million over ten years. that is enough money to buy the land from Catholic retreat center no longer worthy of using the name of the Holy Mother. Let's think of it this way. La Canada with 3 times our area and twice our population pays less for police services than we do. It's a pretty nice neighborhood. We need to cut back of the cops. They claim crime is increasing. What are they doing to stop it or catch the crooks. seems La Canada is a lot smarter than we are! do they have a city council? La Canada has real newspapers. Here we have a propaganda rag designed to sell the agenda of all the people you've just mentioned. Someone needs to call Sargeant DelCours down at the police department and discuss with him how they can justify their third lawsuit against the city in an effort to raise salaries and pensions when the city is supposedly in such dire financial condition. BTW, he's the head of the SMPOA, the police union in town. When I bought here in 2002, the cops were starting out at about $36k a year. Now they're starting at $70k+ a year. What a joke. This city can't afford that, particularly when combined with the lifelong pensions these guys get. Their position should be an intermediary stepping stone to one of the larger districts. Certainly not a lifetime career here. Plus, they have proved themselves ineffective time and time again. A friend of mine got a call from them at 2 in the morning letting him know that his business storage location has been broken into. He threw some clothes on and drove down their quickly, as they requested. As a result of being in a hurry and slightly exceeding the posted speed limit, another one of them pulled him over and gave him a ticket. He explained the situation and he said that was no excuse. Needless to say, our PD has evolved into a unionized harassment tool against the citizens it represents. What a joke. Delcoure is a police officer, not a sgt. that would be correct. because they sue the county for labor disputes. they also look to the county for salary negotiations. and they look to the county to fund their pensions in the out years. they also take advantage of the economies of scale inherant in seeking a fungible service from a larger source. and, when you get burgled, they will tell you to lock your windows just like the smpd dudes (if the window is locked and broken they will give you equally usefull advice such as "if you had put bricks over your windows this would not have happened"). BONUS: WE COULD BUY THE RETREAT CENTER AND MAKE IT A PARK! PS: I ADMIRE, BUT AM NOT, ALL CAPS GUY! 1) Being talked down to like I'm an idiot. Harabedian just touched both bases. Off topic - Sierra Madre property owners are receiving a very disguised Prop. 218 notice in today's mail from Sanitation District No. 15. The District wants to raise your rates but doesn't want to clearly explain how you can vote against the increase. Their "Notice of Public Hearing" is not a honest communication with ratepayers but is designed to have people ignore it. Be alert Tattlers! I have an idea - let's sell Goldberg Park! That way the City could pay back the $300,000 plus they "borrowed" from park funds (that weren't even there) in anticipation of development fees from 1 Carter. That's right, over $300,000 of General Fund monies that could be used for, let me see, Public Safety & the Library? Afraid it is too late to do anything about that useless Goldberg Park. The City received a grant from L.A. County so it can't be sold off. The $20 word for how Goldberg Park came to be is cupidity. I stil!l fume when I drive by Goldberg Park, but not because it is an open space. The Goldberg's were related to Enid Joffe! The Goldberg's didn't deed the property to the city. In fact, the city paid over market value to the Goldberg's for the land and I believe the city is still paying on a deed of trust. Then, the city council decides it's a good idea to name the park, Goldberg Park. Really? Joffe and the Goldberg's had a lot of chuztpah doing that. And the city council has a sign with all of their names on it! Then, they had the audacity to come back and ask folks at a city council meeting to donate money to "improving" the park. Unbelievable! I have an idea, why don't we get the Goldberg's and Joffe to fund any needs for the pocket park out of their own deep pockets! Did you receive the Assessors proposed rate increase for sewer today in the U.S. Mail? Is that Property Tax increase? Tax increase of the week. So many pensions, so little time. Didn't get anything like that today, hope I didn't throw it out yesterday. Give me an address and I'll get an assessors ID, that's public information. The city residents are joint owners! The city of Sierra Madre needs to be run as if it was a business! Nothing will change until such time we hire qualified city employees who will make good business decisions! 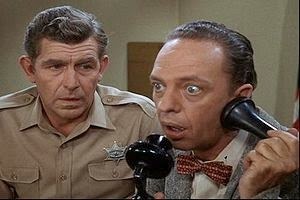 our city employees are acting as if they are barney and andy of mayberry! The bad thing is all good things come to an end. The good thing is bad things come to an end as well. Hopefully we'll be looking at the 2nd option Tuesday night. Just got a phone call from the Yes folks. Sounded like a robo call but I listened through my answer machine and then picked up at the last momment. I don't recall the number but it was out of the area, possibly someone's cell. Then I got a second call and picked up. I was addressed by name and the speal started again. I asked if this Rosemary was from the city and she said no, she was calling from the Yes on the UUT (the speal was loss of services, outsourcing, etc.) I told her I was voting NO and she thanked me and hung up. I would really like to see if they keep a list of all the folks who said they were voting NO. A sort of black list could come of all this. Prolly some phone bank from either the Dems or some union. They are scared silly, and I expect they'll pull out all the stops this weekend. Sit back and watch the corrupt establishment in action. Check out this interesting article on water in California. on pg 3 of the Sanitation Dept flyer: Save Some Money. The Low-Water Rebate Program. Check this out. You are supposed to be able to figure out how much your property puts through the sewer based on the amount of water used and you can get a rebate if you don't push a lot of water from your property (Ie you have been conserving ) through the sewer pipes. If the daily average (for the whole year and for the winter months) is less than 0.26 HFC. you may be eligible for a rebate. This is another reason for water conservation. There is more information at www.lacsd.org or call 855-240-9506. I am going to take a look at my water bill and see if our billing calls this out and I'll report back. "Burglary is the intent to break into a building without consent with the intent of committing a crime inside (including theft). Burglary is a specific intent crime, requiring that the burglar knowingly intend to commit a crime while inside. A person does not have to forcibly enter a building to commit burglary; going in through an unlocked window or door can still fulfill the “breaking” element of burglary. Robbery is another specific intent crime, requiring both theft and a form of violence or threat of violence used to deprive someone of their property. The most common example of a robbery is a convenience store holdup, in which a robber threatens to shoot a cashier unless the cashier hands over the loot." Explain how this matters. And how do you know those perpetrating these robberies weren't armed. Since they have rarely been caught, how would you know? Were you the robber? Well, according to Noah Green, no one should own a gun. He wants to outright ban them.